Writing birthday thank you notes isnâ€™t so hard, and it is always appreciated. Here are a bunch of wording samples to help you write your thank you notes after your birthday bash. Tip: Are you a parent who wants some creative thank you note ideas for your kids? Check out our Thank You Note Ideas for Kids. If the gift was on your wish list â€“ let them know! Point out ways the gift will make your life better. Check out these example thank you notes to get some inspiration for your own writing. And donâ€™t forget, being thankful now will pave the way for even bigger and better presents next year! Thank you so much for coming to my birthday extravaganza! I had a lot of fun, and I really appreciate the gift you got me. Iâ€™ve wanted a Super Soaker for ever. Thanks for celebrating with me. I hope you had your fill of cake. I can not thank you enough for your birthday gift. I am still in awe of your generosity -- I know that necklace wasn't cheap. I keep getting compliments every time I wear it out. You are a great friend, and I am lucky to have you in my life. I had so much fun the other night. Thank you so much for hosting my party. It wouldn't have been the same anywhere else. I hope I didn't make too much of a fool of myself playing Trivial Pursuit. Obviously I need to brush up on my trivia! Thanks again Tim. The food was to die for and the drinks were plentiful. Thanks for the great memories. Thank you very much for the gift card to my favorite coffee shop. You know me and how I love coffee so this card wonâ€™t last long. Iâ€™ll make sure to think of you as I am enjoying my white chocolate mocha! Thanks again! Youâ€™re a true friend. You are the best parents a girl could ever ask for. I can not believe that you gave me a car to use at college. I was preparing to walk everywhere but â€“ big shocker!! You got me a car?? I couldnâ€™t have been more surprised and I still donâ€™t see how you kept it a secret. In this note, Mary shows her parents that she truly is thankful for the big gift that they gave her. She also complements their slyness by admitting her surprise. A big birthday present such as a car definitely requires a thank you note. Thank you for the nice pair of boots that you sent for my birthday. I will be sure to keep warm this winter. Send the rest of the family my love, and give little Buddy a belly rub for me. Many times, distant relatives have no idea what you want so they will buy something almost everyone would use. 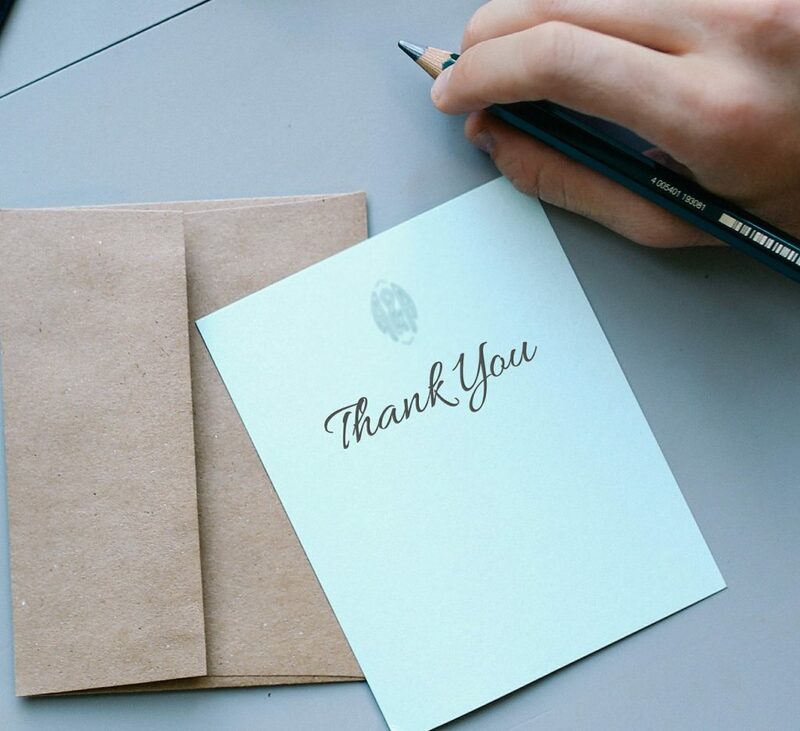 Sending them a thank you note may be difficult, but just putting something in and getting it sent off is important to keep the relationship open. Hey girl. Thanks for the sweet card and the certificate to go to karate classes. I wasnâ€™t serious about giving the boss a beat down but this really made me laugh. Who knows! I may actually be good at karate. Marsha and Jenn obviously have an inside joke going on about their boss. Jenn thought up a great way to brighten up Marshaâ€™s day. Making sure that you thank them will keep the working relationship in good standing. I am so lucky to have you in my life. You are the only one that truly knows exactly what I want. Delivering breakfast in bed was the greatest birthday surprise, and when you added my favorite hot tea it set the day off right. Youâ€™ve set the bar high. Your birthday is less than a month away. Iâ€™ve got to get to work to beat that! This is a sweet note that says thank you and also allows the husband to know that he did a good job. And really, every husband needs this sort of positive reinforcement. Thank you for the card and gift card that I found on my desk. It was a very welcome surprise. I have never had the chance to eat at this restaurant, so I am excited to see how it will be. You are a great boss to work for and I appreciate your thoughtfulness. Janice makes sure that she does not over personalize the note that is meant for her boss, but makes certain he sees that she is appreciative. Since her boss does not know her very well, he most likely bought a gift card to a restaurant that he likes. Whereas a not to a Friend can be casual and fun, when addressing someone of authority, its wise to keep things a little more formal. Need Help Writing Your B-Day Thank You Note? Tell us who you want to thank, and why. We'll write up a sample thank you note within 24 hours.